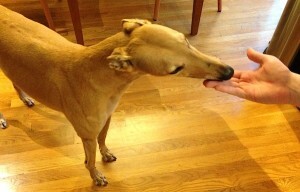 Mr. Frugalwoods and I recently marked the two year anniversary of our adoption of Frugal Hound! It only seems right to celebrate her in this week’s woot. We know she’s just a dog (I swear! ), but she brings an immense amount of joy into our lives. Her lack of awareness about the world around her is refreshing and hilarious. Evidence of lack of intellect: stuck on porch. Couldn’t figure out to go in the other direction. Annnddd only slightly alarming. Let’s just say she would not survive in the wild. Frugal Hound is not what you would call a “smart” dog, but she is an adorable little pumpkin-peanut. If we have a bad day at work, or current events are depressing, or we don’t find any great free stuff by the side of the road, Frugal Hound is oblivious–every day is play day to her! She greets us with loving little jumps and roos every evening and wags, wags, wags her wiry tail. Her tail seriously feels like a piece of wire with some fur glued on. Don’t believe me? 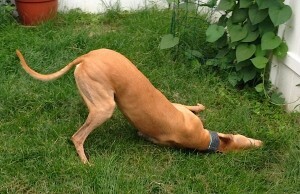 Next time you see a greyhound, squeeze its tail. 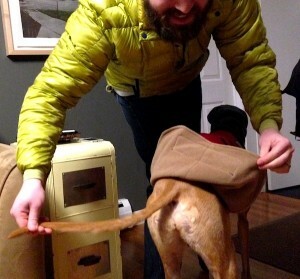 Mr. FW demonstrating Frugal Hound’s wire-tail for my mom, who was knitting her a winter tail cover. 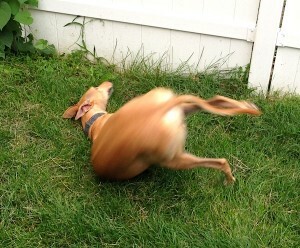 Frugal Hound gets us out of the house every day for at least one long walk, during which she invariably misses the grass and pees on the sidewalk (at least once) and snouts passers-by. She just loves to meet people with her snout and the thing is so dang long, we can’t always pull her back in time. Fortunately, most people are OK with an errant snouting from a greyhound. 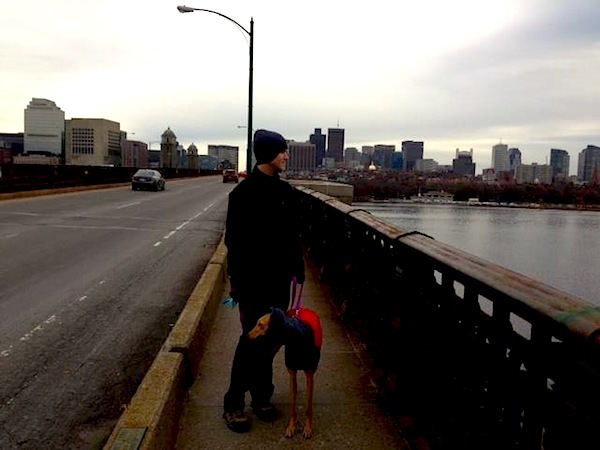 Mr. FW and Frugal Hound walking from Cambridge to Boston last winter. 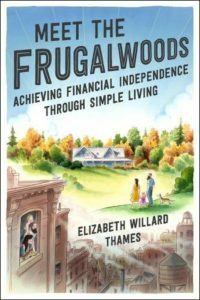 Frugal Hound has actually brought Mr. Frugalwoods and me closer in our relationship. For the first time ever, we have a shared responsibility that can’t be ignored. Unlike cleaning the house or doing the dishes (ahem, hint, Mr. FW), you can’t put off walking or feeding a Frugal Hound. In this way, we always have something to connect over no matter how challenging other parts of our lives might be. She provides a soothing rhythm to life and we’ve found there’s a deep genetic connection to taking care of another living thing. 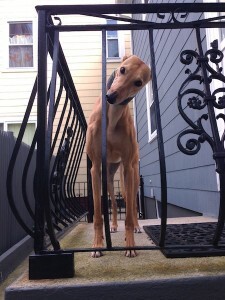 We make it a practice never to yell or get mad at Frugal Hound, which has made our home even calmer than it was before. She’s terrified of loud noises (sadly, probably PTSD from her days on the greyhound racetrack), so we don’t yell anymore. Hey, it’s a pretty nice way to live! 1) Carrying her little stuffed toys from our bedroom into the front exercise/mudroom and then playing with them. That’s it. She won’t carry them from the mudroom BACK into the bedroom. Apparently in her little brain, they only go in one direction, so, she comes and gets one of us to reposition her toys back into the bedroom so that she can start the process over again. The sheer joy she derives from this unbelievably simple act is a sage reminder to us that life doesn’t always need to entail complexity. Get it, en-tail? Mr. FW and I love Frugal Hound in part because she has no logical, redeemable value. 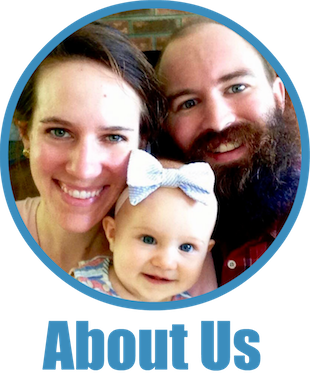 She does literally nothing (and generates negative revenue) yet she provides an intangible, shared joy that makes our family complete. Yay Frugal Hound! Good girl! Mr. Frugalwoods and I longed to get a dog for years before we adopted Frugal Hound. We used to be the people at the dog park without a dog. We’d go sit on a bench and hope a dog would come over and say hi. This was only awkward when people asked which dog was ours–we usually pretended not to speak English. We waited so long because we wanted to ensure we had the time and resources to properly care for a dog. We also needed a perfect blog mascot so we had to audition dogs for years before we found one that captured the true essence of Frugalwoods. Most dogs either a) do not look frugal and/or b) will not pose with clothes on. 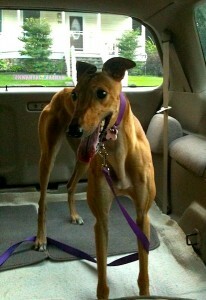 Plus, we wanted a hound the same color as our wood floors so as to reduce our vacuuming requirements. JOKE! Or is it? Exact same color as the floor. Sadly, I think people often leap prematurely into pet ownership without fully considering the ramifications. I talked about this a bit in my I’m Frugal, Should I Get A Pet? post, but I think it bears repeating that animals are a huge financial commitment! They also get stinky and drool on your bare legs. Unfortunately, dogs are surrendered to the humane society and the greyhound adoption group with regularity because their owners can’t or won’t care for them anymore. While someone’s circumstances can change unexpectedly, for example with a serious illness, too often it’s just a lack of planning and foresight. So, before you get a pet, please think carefully about how they’ll impact your life! Hi. I don’t know how to sit properly. Do you have a pet? What have they done for your life? What a perfect post! And how lovely Frugal Hound is 🙂 we have two cats from the cat protection and I love them to bits – they’ve got very different personalities and they make me smile 🙂 I’d love a dog as well but as we’re both out of the house for a long time each day, it wouldn’t be fair at the moment. One day though! Thanks so much! I grew up with cats and loved how distinct their little personalities were. Glad you’re enjoying your two kitties! In ‘How to Win Friends and Influence People’ Dale Carnegie talks about why humans should be more like dogs. If people were always happy and loving, others couldn’t help but enjoy each others’ company. It’s so true. My parents have a Gold Retriever named Oakley. Just over a year old. See my twitter for pics! Makes sense to me–dogs are pretty easy going, happy, sweet creatures. I just checked out the Oakley photos. Verdict: ADORABLE! Happy 2 years! I cracked up when you said you avoided talking to them by pretending you didn’t speak english. And I could totally see getting a dog to match the floors because of shedding. I got my cat Pepe when I was a full time employee, but when something happens to him, in my current state of affairs, I wouldn’t get another pet. I agree that there is so much you put into it and I want to make sure I provide a pet with a good life and not financially strain myself either. That being said, my cat brings me so much joy. He is a comedian in a cat suit, I swear! 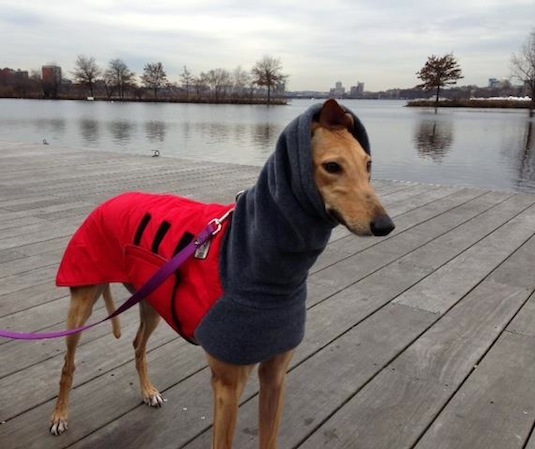 Tell Frugal Hound that she looks darling in her winter coat ensemble! We don’t have any pets at the moment because we travel for work and I know how much responsibility is required with having an animal as I had four cats throughout my life (Winnie, Marmalade, Tigger and Piglet). All were adopted from the SPCA where I grew up in Montreal. I truly believe in the transformational power of pets. People joke that our cat, Spumoni is like a cat/dog, because he is just as engaged with our family as a dog. We even have him trained on some things of course they all revolve around his favorite treats. He has definitely brought our family closer and I can’t imagine (and don’t want to imagine) our home without him. Happy adoption anniversary for you and Frugal Hound! I hope you all have a fantastic weekend!! Yay, Spumoni! Looking forward to publishing his Frugal Hound Sniffs interview next week 🙂 Happy weekend to you too, Shannon! She is so cute, and ridiculously photogenic. I can never get a good picture of our cats. Whenever they’re doing something amusing, the second I get my camera out, they move. My cats are pretty much my furbabies, as we’re not entirely sure we want kids (and still have years to decide). However, I’d really love to add a dog into the mix. Everyone in our apartment complex has a dog, and they’re opening a dog park here soon, which I’ve thought about lurking in… All I know is there will never be a time in my life where I don’t have a pet. From working at an animal shelter, I can tell you far too many people don’t take adoption seriously. Their kids want a dog, so they decide it will be a fun adventure. It was really sad to see how many dogs our wardens picked up off the street. Even worse, if we found the owner, there were a few who would ask us to hold onto their dog for a bit. Seriously!? I’d be running over, and we aren’t a boarding facility. I’ll never get it. So sad about the animal shelter drop-offs. A pet is not a toy! She is a cutie! We adopted our cat almost 2 years ago. She has her own personality. She’s very social and greets our guests whenever there’s someone at the door. She also likes to sit with us on the couch. I’d say she’s more of a dog than a cat lol. Frugal Hound is fashionable, just like her Mama! We call our pugs our first set of children. They were like a mini lesson in caring for others and having responsibility for others. I agree WAY too many people jump into pet ownership without being prepared. It’s so sad. Aww, thanks! 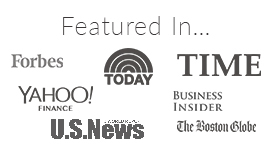 Yes, Frugal Hound is definitely our baby #1 and our ultimate prep for Frugal Baby :)! 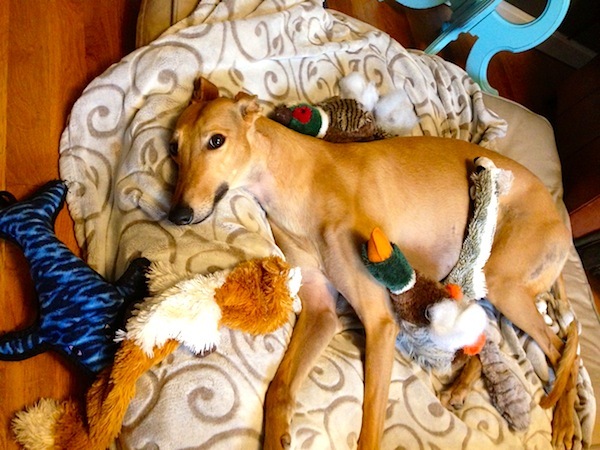 Another great Weekly Woot & Grumble–especially because it features Frugal Hound! Dogs are such Zen creatures, so just in the moment and all they care about is what they are focusing on. Good for you for rescuing her from a horrible life. We have a Golden that brings us so much joy. We’ve had this dog since he was a pup and he is just such a people-loving dog. The dog-owner bond is indeed very special and very strong. Congratulations to you and Frugal Hound for finding each other! I still crack up over her pictures. Legs forever. Our puppy just turned one. I wish I had the patience or calmness you both exhibit with Frugal Hound. Our puppy can make me incredibly angry from eating our walls, puking at 3 am or ripping up the garden we spent 2 months putting in. Alas, we still love him (some days more than others!) and he’s been great for us by getting us out of the house for walks, playing in the parks and meeting new people at the dog park. Thanks for sharing. Perhaps I’ll get a post up of the adventures with our little guy. Puppies are so cute! But they have so much energy! 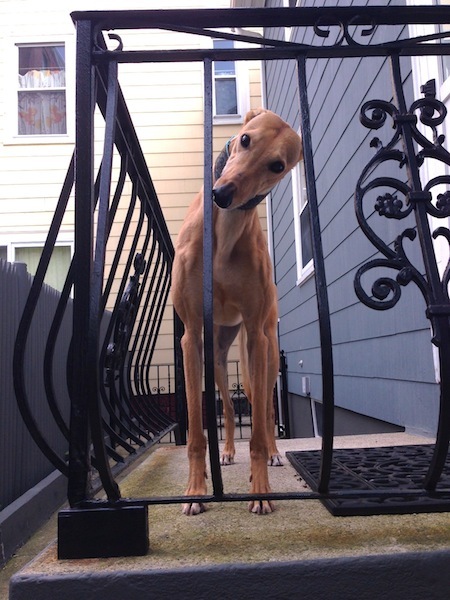 I kind of feel like we cheated because we got Frugal Hound as an adult dog. We never had to deal with the puppy phase :). And, we basically have to wake her up when we get home from work in the evenings. She’s pretty much the laziest dog on the planet. She won’t even lift her head off her bed to look at us sometimes :). Haha congrats on two years. I love that you guys dress her up for the cold/rain! Thanks! In the depths of winter she needs a coat–she doesn’t have much fat or fur to keep her warm :). Thanks for stopping by! You crack me up. I have to remember to NOT read your blog while nursing a baby to sleep. Giggling is counterproductive! We have two dogs – one a stray and the other from the humane society. Our stray is the most expensive free dog ever. Right after we took him in, he nearly died from parvovirus. Then he had demodex mange. Then worms. Then he was healthy for a while until his neck suddenly got as swollen as could be. It was some sort of infection and the antibiotics triggered thrombocytopenia, so he was on steroids for about 6 months. That made him gain weight and then he tore the ligaments in both rear knees, requiring surgery. He’s healthy for now…I’ve said, though, that there would be many days I wouldn’t laugh if it weren’t for Biscuit. He’s been a great dog and a best buddy! I just love Frugal Hound and all your stories and pics of her. I love your descriptions about her intelligence. How many words does she know? They say dogs have the intelligence of a two year old but maybe in FH’s case it is 1 1/2. When we had our dog we used to meet two lovely greyhounds on our walks. I really think a dog makes a family complete and The Irishman and I are missing having one a lot. However, we are looking after our grand dogs for two weeks in Oct and then straight after that our neighbor’s dog so we have that to look forward to. 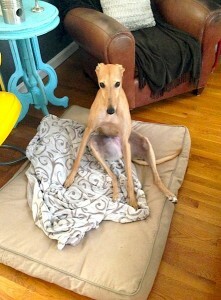 I think Frugal Hound might be more like a 1 year old :). She just has a hard time with life. A minute ago she bonked her head on the door frame–she just rounded the corner too sharply and BAM. Poor thing. She knows about 4 words/phrases: her name (which she knows means to come), Drop It, No, and High Five (her only trick). But she’s such a good dog there’s really no need for her to know more. And we’ve tried to train her, but she just lays down and falls asleep! I’m glad you’ll be able to get some doggie time with your grand dogs! That was an excellent post about an awesome animal. We have a kitty like your beautiful Hound. Not exactly the smartest, but constantly happy. You also know we have pets, and also our stance on surrendering animals. My husband and I also spent years longing for a dog. We finally got one from the local Pound about three years ago. So we named him Ezra. Get it? He came in as a puppy as part of a litter of six. His mother was a Flat-Coat Retriever and she did some unauthorized stepping out. Spay and neuter, people! Our dog is amazing and we love him like crazy. He is actually pretty smart, too. But we did not think about picking out a dog the same color as the floor. That is genius. Ezra has long black hair so he leaves tumbleweeds all over the wood floors. I do a lot of sweeping. The saddest thing to me is when people have a baby and don’t care about the dog (or other pets) anymore. This happens a lot. We brought our son home when our dog was just about six months old, so it was sort of like having a baby plus a hyperactive toddler for awhile. Not the ideal situation, and not what we were planning on (the baby was sort of a surprise.) It was a lot of work, but definitely worth it. And there are a lot of benefits to kids growing up with pets. I think your dog might be smarter than you think. I am pretty sure that she is playing fetch with you, having you return her toys to the bedroom. “This was only awkward when people asked which dog was ours–we usually pretended not to speak English.” That line totally cracked me up. Brooklyn brings us such love I can’t imagine life without him. We’ve also made it practice not to yell or get upset with each other in front of him. If we raise our voices he gets visibly upset (he’s a rescue and we suspect he was abused). Awww Brooklyn! I think Frugal Hound is the same way—she really dislikes loud voices. By the way, Brooklyn should do a Frugal Hound Sniffs interview :)! For me that would be a longhaired chihuaha they are so affectionate and playful with their owners that you can’t help but feel they are part of the family. They show love unconditionally but I feel most dogs are like this. I have a Boston Terrier, and she’s never had an interest in toys. Just wants food and to hang w/ me. So that’s perfect. I give her good quality food, keep her weight in check and get her a yearly checkup. I think it’s worth it for the mental benefits. Awww, definitely the perfect dog! I agree with you, the annual check-ups are so worthwhile for the peace of mind. Frugal Hound stares too! And blinks at us expectantly, like, humans, what will your next trick be :)?